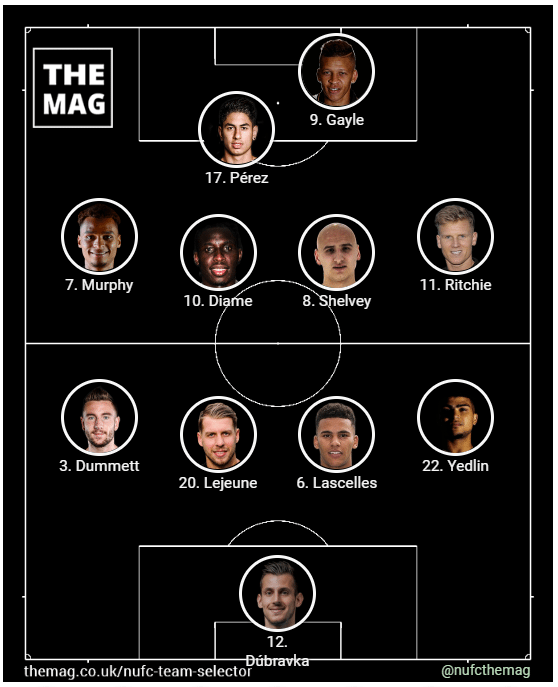 This is the predicted Newcastle team v Chelsea for Sunday afternoon. Rafa Benitez has relied on pretty much the same side game after game since 11 February (1-0 v Man Utd) and returned to the usual eleven at Wembley on Wednesday. However, he has to make at least one change from that team with Kenedy ineligible to play against the blues. As these last handful of games have gone by, the options open to Rafa Benitez have dwindled ever further. Christian Atsu and Ciaran Clark both injured. Whilst Chancel Mbemba appears to have gone missing, the defender not featuring in any of the recent photos from the training ground. Never mind playing, he hasn’t even made it onto Newcastle’s PL bench since December. So, difficult to see many changes against Chelsea, especially as it is a game where Rafa will want to put his best possible team out to try and round off the season well in front of the home fans. Joselu and Manquillo got a chance against Watford but were poor. You can’t see Rafa swapping Dubravka for either Elliot or Darlow. Gamez and Haidara are leaving the club next month. So that leaves us with Jacob Murphy, Isaac Hayden and Mikel Merino. Jacob Murphy was a little unlucky to be frozen out when Kenedy arrived, he’d actually shown improvement and promise, including scoring at Man City. I predict that he will be the only change tomorrow. He looked sharp on Wednesday night when coming off the bench and playing on the left, he made one brilliant run when cutting in past his opponent, only to blast the ball over the bar after doing all the hard work. You could maybe make a case for Hayden and especially Merino, to get a game, but even more so I think Shelvey and Diame deserve the chance to end this season on the pitch, as they have been at the heart of the improvement since the turn of the year.